The finished dish was one of the best I’ve made from a 19th century cookbook. This recipe for Stuffed Chicken is from Bertha Gumprich’s “Complete Practical Cookbook for the Jewish Kitchen,” on page 127. 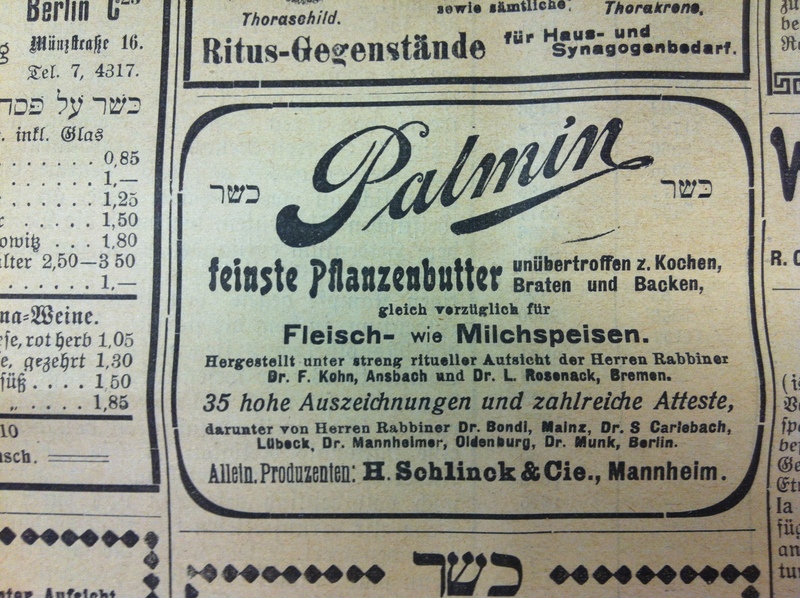 I used a modern reprint of the original, which was published in 1896. Dampen 1 to 2 white bread rolls in cold water. When they are soft, squeeze them out very well, add salt, pepper, nutmeg, finely cut parsley, and two eggs to that. Mix well. 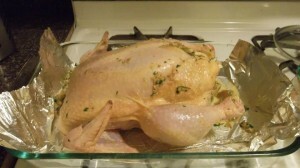 Rub the hen inside with a little pepper and salt, fill it with the filling and sew it shut. Lay it in a pot, sprinkle with salt and pepper, add fat to it and bake it until golden, basting often. Discard the fat, pour a little bouillon in the pot, and make the sauce creamy with a little wheat starch. The sauce is served in a saucer with the hen at the table. This was also the first time I used nutmeg in a savory dish. 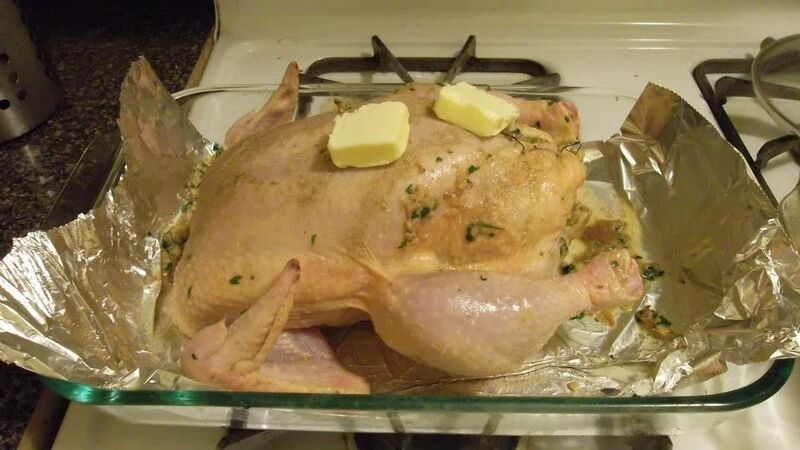 In fact, most of Gumprich’s chicken recipes call for the same seasonings: nutmeg, parsley, onions or shallots, salt, and pepper. 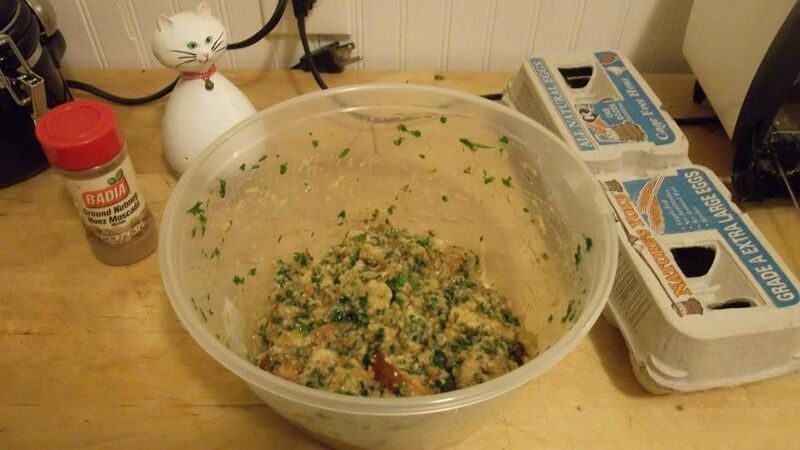 Occasionally, recipes call for ginger or garlic. 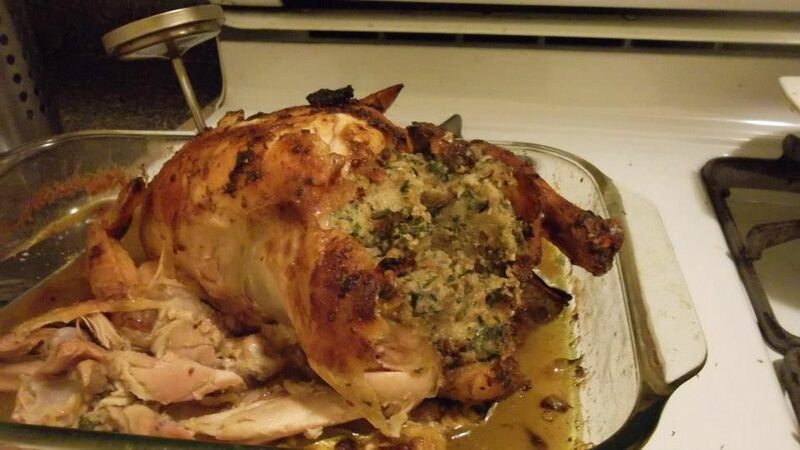 In the end, the stuffing from my recipe was a little mushy but tasty from the nutmeg and other seasonings. 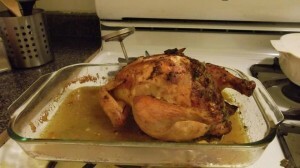 I should add a caveat that, despite the intention of the cookbook’s author, the recipe as I prepared it was not kosher. The recipe called for fat. I thought butter would be an excellent fat, and it was delicious. It also rendered the dish treyf (not-kosher). 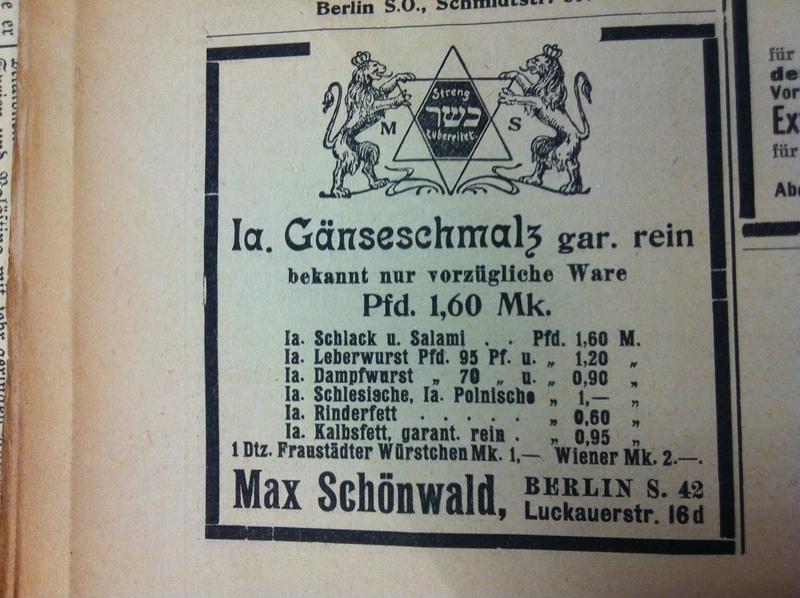 In her other chicken recipes, Gumprich specifies “Gänsefett” or goose fat, which is also something I don’t keep around or even know where to buy. The “sauce” or gravy, made with bouillon and wheat starch, wasn’t half bad. 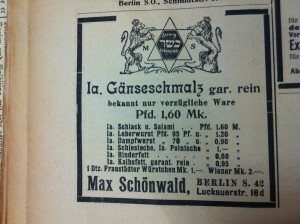 Here are pictures from the chicken recipe; including photos from a German-Jewish newspaper advertising Kosher fat alternatives. Like most of Gumprich’s recipes for chicken, the stuffing is seasoned by nutmeg, parsley, shallots, salt, and pepper. Before the chicken is stuffed, it is liberally salted and peppered inside and out. Gumprich’s recipe calls for “Fat” without specifying what kind. Contemporary cooks keeping kosher kitchens would have known what to do. 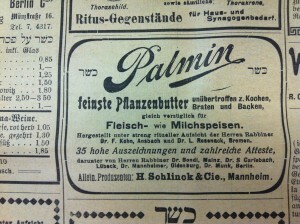 Around the turn of the century cooks gained access to another butter alternative, “Palmin”, made from coconut oil. The chicken emerged from the oven with the beginnings of a delicious gravy forming in the pan.